Colorectal cancer (CRC) is the 3rd most common cause of cancer death worldwide. Regular screening of the asymptomatic population can drastically reduce the mortality rate. CRC screening includes several proceedings although the gold standard remains optical colonoscopy (OC), which is unpleasant, causes pain and discomfort. 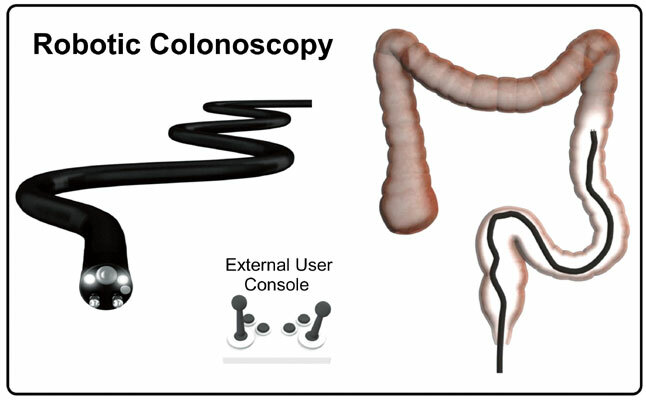 New technologies exemplified by capsule endoscopy (CE) constitute alternative painless solutions and despite their limitations, e.g., passive locomotion and absence of on-board instrumentation, are being increasingly used for CRC screening. Research and development centres are investigating novel advanced robotic technologies for diagnostic and therapeutic use. These include wireless communication, active locomotion, sensors, diagnostic, and therapeutic instruments. This review describes the traditional OC procedure and the existing robotic technologies for CRC. Colonoscopy, robotics, capsule endoscopy, colorectal cancer, cancer screening.